The first Now was released on 28 November 1983 and featured 30 UK hit singles from that year on a double vinyl LP or cassette. Although the compilation of recent hit songs into a single release was not a new concept (K-tel and Ronco, for example, had been issuing various artists' compilations for some years), this was the first time that two major record labels had collaborated on such a venture. Virgin agreed to a deal with EMI, which allowed a greater number of major hits to be included (the first album in the series included a total of "eleven number ones" on its sleeve). The album went to number one, and soon after, CBS/WEA's The Hits Album, adopted a similar format to Now!. The two series co-existed for the rest of the 1980s, but when Universal joined the collaboration the Now! series was more successful commercially. The Out Now series by MCA and Chrysalis was also established as a rival to the series, but was short lived”. "It's Now day!" declares Jenny Fisher, settling into a sofa in a relaxed, but cramped little room on the second floor of Abbey Road. The Now series began in 1983 as a way of showcasing the success of Virgin Records which, at the time, was having an unprecedented run of hits with acts like Culture Club, Phil Collins and UB40. They took the idea to EMI, who were so impressed they linked up with Virgin to release it - the first time that two major labels had collaborated in such a way. Today, the series is so big (120m sales and counting) that all the record labels get a look-in. But that doesn't mean that compiling the 100th edition will be easy. "It looks like we won't be able to clear Drake," sighs Steve Pritchard, a 58-year-old motorcycle enthusiast who's been a custodian of the series for more than half his life. Steve has been working on Now since its 19th edition (side one, track one - The Clash, Should I Stay Or Should I Go) and it's not the first time he's struggled to get permission for a song. "Historically, a lot of big American artists didn't really understand Now," he explains. "They saw it - erroneously - as cannibalising their own sales. We were never able to access Madonna, for example." Still, Drake hasn't been crossed off Steve's master list just yet. Some songs get cleared right at the last moment… and we're only just getting started. He's joined in the studio by Peter Duckworth, who's been working with him since Now 20 (side one, track one - Vic Reeves and the Wonder Stuff, Dizzy). Jenny is a relative newcomer, having signed up for Now 82 (side one, track one - Fun ft Janelle Monae, We Are Young). For the 100th anthology, however, disc two is being handed over to classic hits from previous compilations, including Phil Collins (who opened the very first album in 1983) and Robbie Williams (who's appeared more times than anyone else). That means the mixing session at Abbey Road is over - but the work is far from over. Jenny scurries off to her office, where she has to write a biography for every artist on the compilation. Her text gets sent to a designer, who works through the night to finish the artwork. "Then we listen to the CDs all the way through three times looking for any explicit lyrics or audio that doesn't sound right," Jenny says. "Hopefully by tomorrow night, we'll be completely happy with it, and we can send it to manufacture and start the process on Wednesday morning". One of the problems that exist with Now is the demographic of genres. Look at any number in the series and you will see more Pop music than anything. When I was growing up and listening to the series – as I shall explore later – there was Dance and Electronic stuff but it was mostly Pop. It seems exceptional and amazing to consider, given we all do our own playlists, we still have an appetite for Now. The fact the latest edition sold well was not to do with history and nostalgia but the fact we want the best of the current crop in an album. There is something wholly unsatisfying about having a digital playlist and listening on a phone. You want to have something physical because, as you grow older, these Now C.D.s are the sound of a particular time. Whereas studio albums can sound dated and have potency in the moment; Now seems to age without wrinkles and provides pleasure and nuance whenever you play it. Maybe it is the eclectic selection of songs and the range you get but there is always something to enjoy. I think of the Now series as pick ‘n’ mix. You get so many colours and flavours in there and it is a real treat. Many might say the quality of the music has gone down since the 1980s (or when it was at its peak) but that is another argument. We all have our opinions regarding quality but I feel Pop still plays a big part. It is amazing when you look at any compilation and see entire genres wiped out. Take the 1980s and the brilliant Hip-Hop that was coming out in 1988/1989. Maybe it was Now 16 or 17 around about that time but, I know, there was music by Phil Collins and other Pop acts included. Consider the Hip-Hop genius from De La Soul, Public Enemy; Eric B. & Rakim and Beastie Boys and that didn’t make it on there! In essence, the Now series is about chart music and the mainstream. There is nothing wrong with that but, like these decade-defining compilations; does it truly reflect music in a particular time or is it a very Pop-biased viewpoint?! Maybe there is a very narrow and particular sound that you get with the series but, for those who want Hip-Hop, Metal and other genres then there are compilations and albums that do the job! I think we have that taste because it, as I said, defines a year and you can look back in years to come and compare how music has evolved. In many ways, Now is a way of charting the changes in the mainstream and the tastes of the public! My first exposure to Now was, as I have mentioned before, 24. This came out in April 1993 and I might have got it for my birthday (9th May). For a then-ten-year-old, it was exciting having this assortment of chart songs in my hand. In fact, the compilation exists in C.D. form at my family’s home but I bought it originally on a double-cassette. The giddy joy of reading the notes and credits on the inserts and popping the tape in the deck...pure bliss! I was blown away you could have Shaggy, k.d. lang and Paul McCartney on the same compilation! Before the Internet and streaming, the only way we could get a compilation was to record (perhaps, illegally) material from the radio. You could put a blank tape in one deck and then hit ‘record’ when the chart show was on. It was horribly crude and awkward but having a lot of top-class material on cassette/C.D. was wonderful. There are articles that poll the Now series and rank the very best. Here is one from Metro and, aside from the omission of my favourite, it is hard to argue against their top choices. There is a general consensus that the majority of the finest Now compilations were released in the 1990s – a few from the 2000s, I guess. If you are looking for a particular Now compilation then there are details here but a lot of people think Now That’s What I Call Music! 44 as the best. It is the biggest-selling and came out right at the end of the 1990s. Bangers and gems from Lou Bega, Britney Spears and Moloko cannot be sniffed at. I remember, tragically, Mambo No. 5 (A Little Bit of...), being one of the songs I was listening to when I opened my GCSEs in 1999! I think there are a lot of happy memories for those of us who were school-age around that time. Even if you are younger/older; you cannot deny there is a lot of fun and catchy music on there! The music seems to defy age and you can pick up what is on there and instantly get behind it. No matter which one of the series is your favourite, it makes you feel warm and happy listening back to the artists that were popular when you were younger. Every one of the Now compilations has some tragic crap on there but that is the charm – you’ve got to have a little bit of greenery among the sweets! Many of us have our own memories and reasons why Now is very much the sound of the present – but has that important nostalgic feel to it. “...And yet Now! got a lot right from the start. An eye-bulging 11 No 1s were present on the first edition, but look again and you’ll find the latent influence of punk through the presence of Malcom McLaren, The Cure and Stiff Records’ definitive version of Kirsty MacColl’s “They Don’t Know” (courtesy of Tracey Ullman). It was a democratic hallmark of Now! albums that all genres must be represented and soon entire sections of the record would be devoted to different types of music: “dance” sides emerged strongly in the late 1980s/early 1990s just as “indie” sides were a staple through Britpop. In fact, it could be argued that Now! 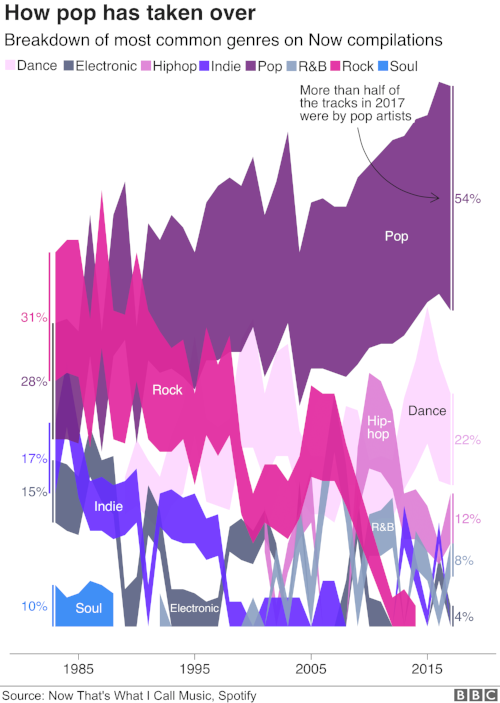 did as much in the pre-digital age to diffuse music’s tribal instinct as Spotify does today. Nothing lasts forever and, looking back, the school holiday sound-tracking Now 12 of of 1988 was a personal peak. Within 18 months, myself and Now! would go our separate ways, the age of innocence over for both of us. As a new decade began, Now! moved towards a more straightforward, does-what-it-says-on-the-tin approach, gaining sales but losing some of the charm of earlier collections. Me? I’d heard The Stone Roses’ debut for the first time and things would never be the same again. The Smash Hits subscription was cancelled and the NME installed in its place. Now! was then: I had the Nineties to be getting on with. Yet while I was away, the series prospered; 1999’s Now 44 was the most successful to date – selling 2.3 million copies, at the height of the CD market thanks to big hitters such as Britney Spears and Robbie Williams. Yet in the age of personal curation that followed, Now!, perhaps the ultimate curator, would somehow come into its own. At the same time, the idea that the internet would render everything before it obsolete proved false; instead, we were in for an era of co-existence. Things weren’t replaced, simply enjoyed side by side. Hence Now! CDs continue to be played in cars across the country, hours after their drivers have enjoyed a Spotify-assisted morning run and before they returned home to their Crosley turntables”. “Jonathan Isaby has every album in the series. Here he explains how they have formed the soundtrack to his life. Now 67 was released around the time I met my now wife in 2007 and brings back fond memories (she tolerates the collection by the way)”.